Dirty shutdown is a most common issue in Exchange server which causes the inaccessibility of EDB file. Dirty Shutdown is nothing but the state, whenever users switch off their systems without proper shutdown. 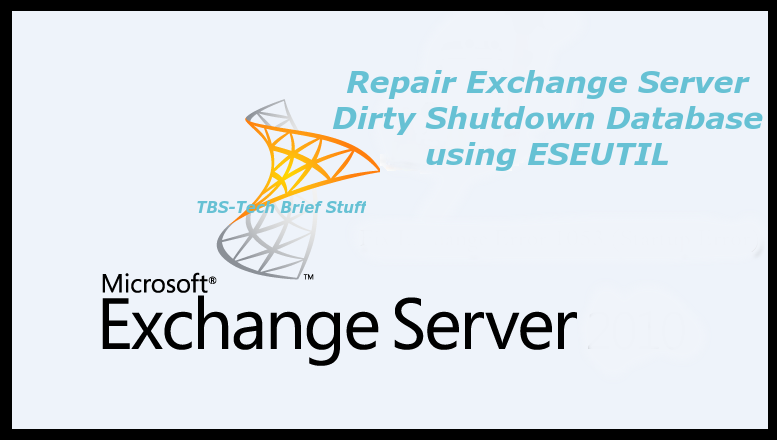 Either by sudden power cuts or by improper shutdowns this makes the Exchange Server database corrupt or inaccessible sometimes. There are so many other reasons for corruption of EDB files in Exchange including, JET engine errors, unwanted virus attacks, server crash etc. The inaccessible data can be repaired through Exchange server's In-built commands. In this blog we will elaborate the concept of Eseutil command to repair the inaccessible Exchange mailbox. Copy the entire original database along with log file into a working directory and somewhere else so that while making repair of that database if it becomes unsuccessful then u will have a copy of it to repair it further with other utility. To start the repair process, I'm going to assume the temp directory for the database mailboxes is e:\temp\data and they are named as exchdb.edb, exchdb.stm. If they are stored in 1st Storage Group then the name of the transaction log will be E00.log and E00xxxx.log. Let's assume that this log file is stored to e:\temp\logs. Now the files come in clean shutdown state. but this process will be terminated after using Isinteg it removes all the remaining errors present in that mailbox database then you will be able to mount it back to the Exchange server but before mounting it, you need to copy that database to the original location where the database was stored earlier. Then you will be able to mount it. Alternative to 'Eseutil': In case if you are not able to resolve dirty shutdown problem with Eseutil commend then there is another method is available which name is PowerShell cmdlets as we know for using PowerShell cmdlet one should be technically advanced, this technique help to extract data from Exchange server mailbox easily.